THIS week the South Eastern Regional College’s Paralympic swimming gold champion Bethany Firth from Seaforde, better known in the sports world as a professional swimmer, is back to porridge. After setting a new Paralympic record, the 16-year old returned home last week and it was back to college in Newtownards where she is currently completing a Catering and Nutrition qualification at SERC. At only 16, Bethany has already won several major titles including winning silver at the 2011 European Championships. Humble Bethany, who recently had her village post box in Seaforde painted gold in her honour, claimed the Paralympic record victory for Team Ireland in the 100m backstroke, despite having only been swimming for three years and sustaining a shoulder injury earlier this year, which had her fitness in doubt on the run up to the London 2012 games! 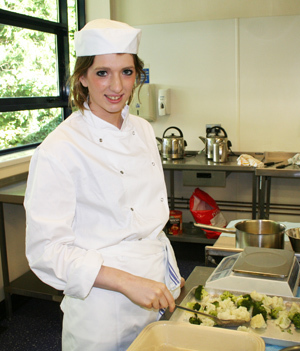 Paralympic gold medal swimmer Bethany Firth back at work in SERC in her catering course. Commenting on her short time at SERC, Bethany said: “The atmosphere is really good and I have already made lots of new friends. I just hope I don’t burn anything. “I am looking forward to learning a new trade and am very proud to have brought a gold medal home with me,” added Bethany. Ken Webb Principal and Chief Executive at SERC said: “We are delighted to welcome Bethany to SERC. I think she will be a real inspiration for the other students and for them to see what can be achieved through hard work; confidence and determination will be a great motivator for them. Bethany said she hopes her achievement will inspire the younger generations and anyone with a physical or learning difficulty to get involved with sport.